Provide comfort for the family of Beverly Oudshoorn with a meaningful gesture of sympathy. brother Trevor Allison (Ruth) of Orillia. She will be dearly missed by her four children Darryl Lunney (Paula) of Edmonton, Jeff Lunney (Cathy) of North Bay, Sandy Lunney (Bob McDonald) of Bowmanville, Sharon Farrow (Don) of Bobcaygeon and stepson Dave Oudshoorn (Maureen) of Edmonton. Cherished Gramma of Jillian, Jenelle, Brad (Deanne), Chad, Chelsea, Michael (Jodie), Lisa (Cody) Laura-Katrina, Kieran, Liam, and Reiger and proud Great-Gramma of Gregory, Henry, Isabel, Allison and Jaxon. Bev had an exciting life of travel and adventures. Among many things, she enjoyed entertaining, playing bridge, reading, theatre, cottaging, dancing and playing the piano. 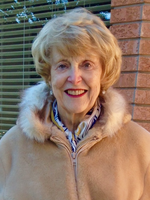 She was an active member of the Probus Club and volunteer with Hospice and Palliative Care. Visitation will be held at St. Paul's United Church, 178 Church Street, Bowmanville on Saturday, April 13, 2019 from 11 a.m. - 1 p.m. followed by a Memorial Service at 1 p.m. A reception will be held in the Church Hall following the service. To send flowers in memory of Beverly Oudshoorn, please visit our Heartfelt Sympathies Store. Provide comfort for the family of Beverly Oudshoorn by sending flowers. My sincere sympathy to all of Bev's family. I have many great memories of your mother who I first met when we took piano lessons from the same music teacher when we were girls. Over the years we played bridge together, had wonderful shopping trips, many chats and lots of laughs. Thinking of you at this difficult time.